My blog post’s title, The Complete Listing of Data Visualization Conferences, is absolutely ridiculous. On purpose. This guide is far from complete. 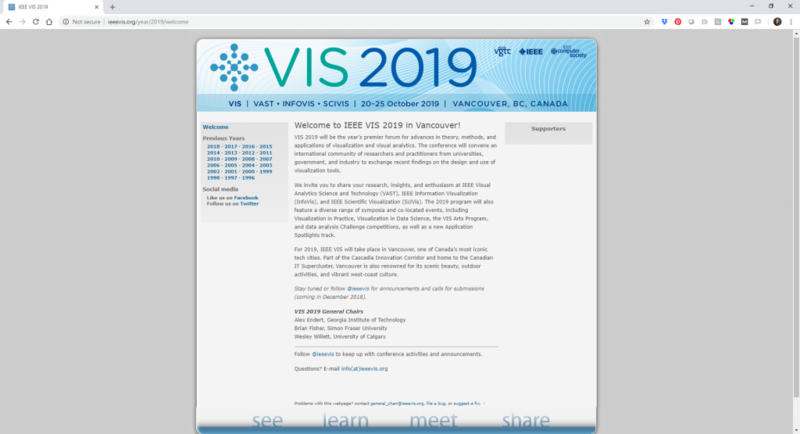 So, I sat down and began pulling all the details together–a list of the major data visualization conferences, the conference websites, the hashtags, the dates, the registration fees, and real-life people they could learn more from. Then, I realized that other people, beyond my workshop attendees, were hoping to attend data visualization conferences, too. And it’s really hard to find information about which conferences exist. Hence the need to share this listing with a broader audience through a blog post. I think you’re right. It doesn’t seem like @visualized @OpenVisConf d3.unconf, PLOTCON and maybe even @tapestryconf are running this year. Best bests are probably @eyeofestival or @InfoPlusConf or your local data viz meetup if you’re luck enough to have one of those. Data visualization is addressed in one way or another at tons of conferences. Any organization that’s using data should be talking about how to communicate that data. So you’ll see individual conference sessions about data visualization, or dashboards, or infographics all the time. 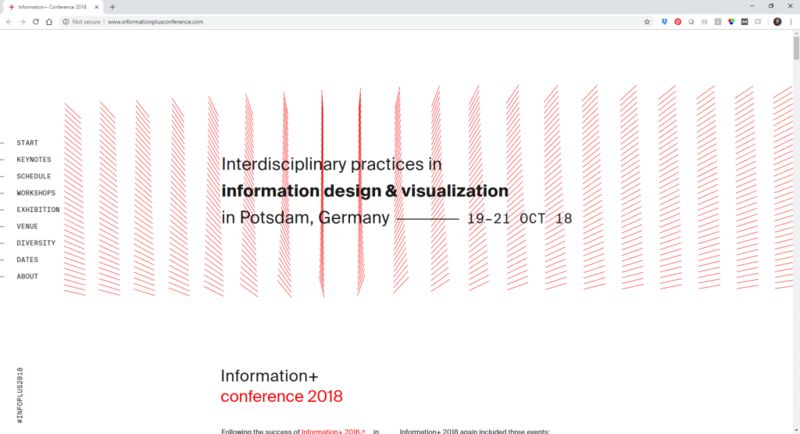 In this listing of data visualization conferences, I tried to focus on conferences where data visualization is THE focus. Here are the major data visualization conferences (in alphabetical order). My dataviz friends warned me that I shouldn’t write this blog post. Yes, that’s a small risk. But, yes, I also trust that you know the difference between sending a few staff to a conference to get inspired and collect new ideas versus bringing in a professional to improve your entire team’s dataviz skills and spur organizational culture changes. Okay, back to the conference line-up! Seems to have an arts/design focus more than a data/spreadsheets focus. For example, they mention architecture as one of the conference topics. I can’t think of any of my personal clients that would be a good fit for the Eyeo Festival. Of the 2019 speakers, I’ve heard of two of them–Nathan Yau and Moritz Stefaner. I could (should) be learning more about the art/design side of data visualization. My background is in the data/research side, and I always learn a lot when I approach a topic from a different angle. Francis Gagnon wrote about his Eyeo Festival 2018 experience. His quotes about interacting with fellow attendees stood out to me: “Eyeo is a special moment in time. It’s one of the most hyped conferences in several fields and it sells out quickly. Yet, so many of us stand in the middle of this rare mix of people, looking at our phones. Having conversations with people at home. Keeping strangers at a safe distance on Twitter. Watching or interacting mildly with acquaintances on Facebook. Plunging back into work on Slack, as if our brains didn’t remain there afterwards… The Eyeo organizers have gone to great lengths to make the experience of attending more real and less virtual. The workshops on Monday were very interactive, forcing the participants to get to know one another from the beginning. The delightful personalized button designed by Giorgia Lupi based on our answers to a survey were playful conversation starters. The program of the conference printed on the back of our name tags gave us one less excuse to pull out our phones to check the schedule and then slip into email or social media.” I’m afraid that phone use isn’t unique to Eyeo. I’ve been to EyeO in 2018 and for an “analytical dataviz” person it’s really about opening our horizons. There were a few dataviz speakers (A Cox, G Lupi) but it was mostly people outside the field, in art and tech. They’ve held events since 1996–whoa! Academic-focused? All the 2019 conference organizers are from universities. Seems to draw in a really diverse international crowd? I would love to meet people doing dataviz from places other than the U.S. and western Europe. I have so much to learn from them. Seems to be a great place to learn about research on data visualization? This is a week-long conference. Attracts people from across the globe. I know of 6ish colleagues who never got visas to #ieeevis in Berlin. All are middle-eastern or Indian-born researchers at American schools. Word has it that the German government is nervous that they’ll lose ability to return, so it slow walks visas. In Fall 2018, all these conferences were basically scheduled on top of each other (oops). I know very little about this conference, but it’s well-regarded by friends and acquaintances that I trust, so I want to learn more! If you’ve got the inside scoop, please comment and let me know. The Program Committee is very, very impressive… Isabel Meirelles… Andy Kirk… Gregor Aisch… Robert Kosara… Nadieh Bremer… Elijah Meeks… Wow. Is this an every-other-year conference? They held one in 2016 and another in 2018, and I don’t see any 2019 details online yet. Malofiej, the Infographics World Summit, describes itself as turning the conference city into “the world capital of infographics.” Apparently this conference has been going on for 27 years–whoa! I have no idea how to pronounce this word. It’s a Spanish word, right? So, ma-LOW-fee-ev? 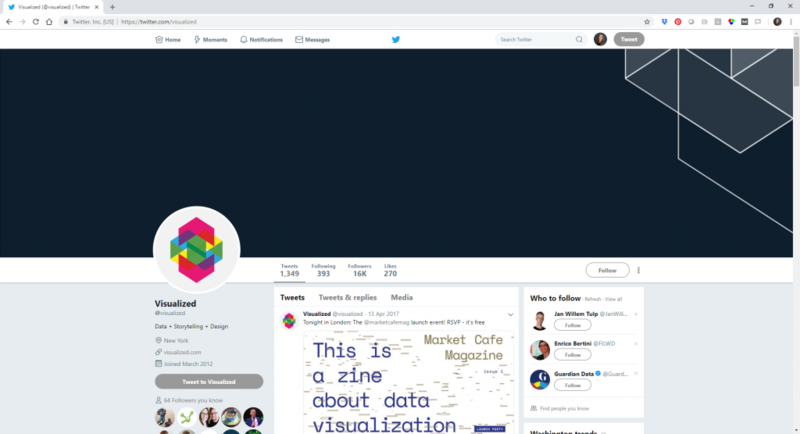 Seems to attract the artsy, creative side of the data visualization field… people who describe their work as information design more than as data visualization. Or maybe it’s for data journalists, i.e., people who work for newspapers? The speakers mostly work for newspapers, like the Times of Oman, O Globo, the New York Times, and the Washington Post. Okay, yes. It’s for data journalists. Right? On second thought… this is THE conference I would attend. It seems very professional, very well organized, and very well regarded by the dataviz experts I admire. Ranging from old timers like me to those starting out. This conference used to take place in Boston (since 2013), but recently moved to Paris. The open-source-tool-focus is interesting. My first impression was that I would personally prefer to attend a best practices conference over a tool-based conference. But, you’ve got to use some sort of tool in dataviz, so why not master the open-source tools? Too bad it’s based in Europe now! If/when it returns to the U.S. (likely to Boston in 2020), I might try to attend. Like most conferences, the sessions are recorded and the videos are available online. So, like most conferences, the value is probably more in building relationships than in the session content. OH! This was where Maarten Lambrechts introduced his xenographics project! So I have heard of this conference. That was a major project last year and I definitely had FOMO while “watching” the conference through the Twitter hashtag. Lynn Cherny wrote a detailed post about OpenVis. Her article is a must-read for anyone considering OpenVis. Open Vis is my absolute favorite! The conference is not sponsored by a corporate tech tool provider. OpenVis is less academic than Info+, I would say. When I sat down to write this guide, I didn’t plan on including software-specific conferences. Excel has multi-day conference events, and so does Adobe, and Google probably does, too. But I had to include Tableau here because it’s becoming such a major force in the data visualization field among my workshop participants. Lots of Millenial-themed activities. I think I saw ping pong tables in some photos. They have some sort of photobooth where you can hold up props and write nerdy data stuff on whiteboards. At 33, I’m already too old to attend this conference. I’ve been to the @tableau conference once when I was lucky enough to have funding. It’s definitely for those going deep into data viz. The workshops were excellent. I’m not great at “networking” but it was nice to find other .gov folks out there! 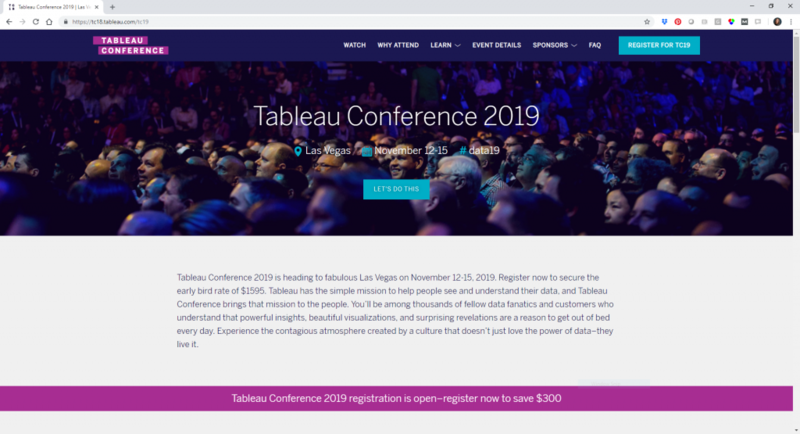 For Tableau it probably helps to use the software of course but it has a great mix of attendees and user profiles – artsy viz people, scientific, developer, business managers, it was so inspiring. I rarely get FOMO. At any given time, you’re missing out on 99.999999999% of everything happening in the world. But seeing the Tapestry Conference photos on Twitter last year… sigh. I really wanted to be there. Seems like a great place to hear about the field of data visualization, if you can call us that. At the 2018 conference, for example, Elijah Meeks’ closing keynote was about the Third Wave of Data Visualization. All the presentations seem to be recorded and available for free on YouTube? So… like most conferences… the point is to meet the people, not listen to the presentations? Jon Schwabish and Cole Nussbaumer Knaflic reflected on the conference experience on an episode of Jon’s PolicyViz Podcast. 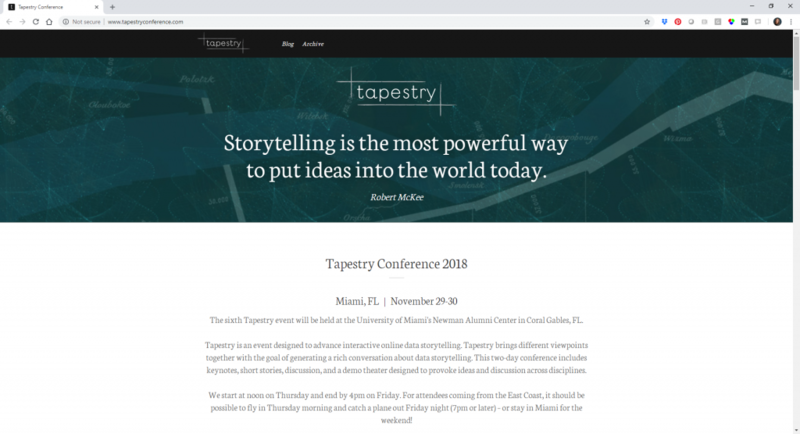 Cole also wrote a blog post about the Tapestry experience. It’s a small group, which is a major draw for lots of prospective attendees. 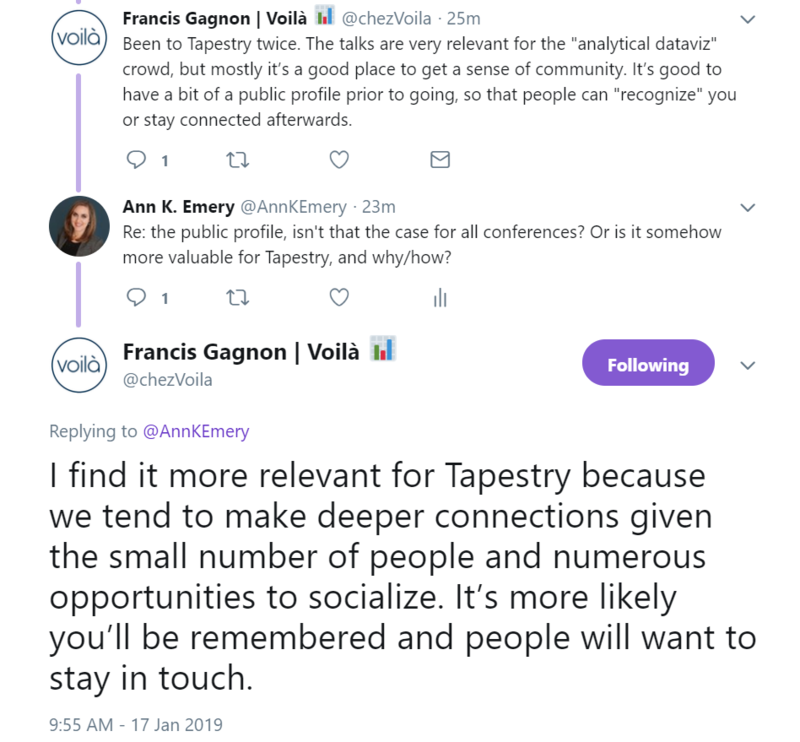 We don’t know yet about Tapestry 2019, but it’s also not a clear no. We’ll know more in a few weeks. I wish I had more information about this conference. 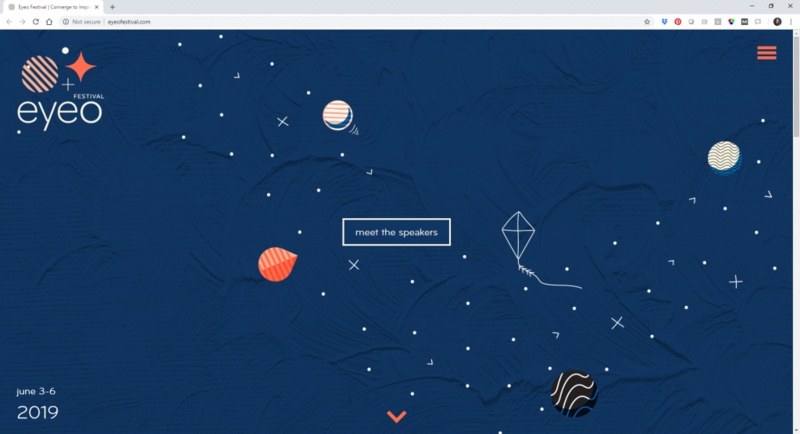 The conference website leads to a Vimeo page? Help me fill in the details, please! This conference has existed since at least 2012. Past events have taken place in Milan and New York. It’s hard to find out what’s going on with future conferences. Is this an every-other-year event? I’m really liking the size of this conference–big enough to meet plenty of cool people, yet small enough to not be overwhelming. The American Evaluation Association has a Data Visualization and Reporting track, so you can attend these conference sessions and hear from practitioners who are using some dataviz in their own work. One of my favorite clients, the Ann & Robert H. Lurie Children’s Hospital of Chicago, is organizing the first-ever Advancing Analytics for Children’s Hospitals two-day conference in June 2018. Although it’s not a dataviz conference, any conference that’s focused on analytics is going to have tons and tons of data and graphs. And speaking of Chicago, Andrew Means’ Good Tech Fest will probably have sessions about building a culture of data in the social sector, of which data visualization is one component. NTTS is about official statistics with a section on dissemination (including #dataviz). Not sure if fits your definition of #dataviz conf. I love to be there and, one week later, attend Malofiej, for a totally different experience. I have no idea where My People go, tbh. In the Netherlands we have the @InfographicsNL conference in November and (new this year) in April the S-H-O-W conference (https://t.co/cWR1TQD5qQ). Both 100% dataviz! Visualizing Knowledge is organized annually by the information students at @AaltoARTS. It started originally as an attempt to make visualizarion better known in Finland, and was in its early days especially geared towards non-experts. Maybe you want to add the IBCS Annual Conference: https://t.co/N72CTSXCY3 have a look at past years conference pages to get an idea of the topics discussed! Your budget is limited. And so is your time. Most of us can’t spend all our money and time globe-trotting and attending every single conference just for fun. 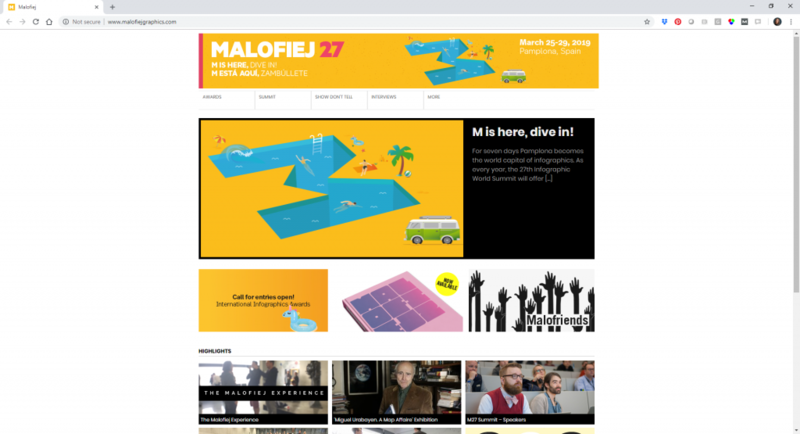 I would attend Malofiej. I think it’s a setting where I could gain practical skills; push my boundaries about what’s even possible; get inspiration; and meet friendly people that I could stay in touch with online even after the conference ends. The awards portion is simultaneously the conference’s biggest strength and weakness; seeing the best infographics in the world would be inspiring and intimidating all at once. But, none of that matters. I’ve got two tiny kiddos. I only travel internationally for client projects. Travelling internationally for a conference is out of the question for a few more years. Tapestry is more realistic because it’s held in the U.S. Plus, it has excellent reviews from past attendees. Plus, the small setting is very appealing. I’m an extrovert but I still get lost in big crowds. Limited by time and/or money, like me? You can always attend your city’s meet-up group. Or, organize your own group! And there’s always online training, hint hint nudge nudge. What conferences am I missing, either dataviz-focused conferences or industry-specific conferences with some dataviz sessions or tracks? What details am I missing? I listed the dates for the next event, the conference website, and so on. Do you wish there was information about, say, the number of attendees at a typical conference? And most importantly–if you’ve attended any of these conferences already, what’s your impression? I’m not looking for Debbie Downers or pessimists or conference-bashers here. I’m trying to figure out the academic backgrounds, career settings, interests, etc. of the typical person who attends these conferences. For example, if a graphic designer wanted to attend a dataviz conference, which one should she attend? What about a data journalist? What about an academic researcher? Where would they find their tribe? Help me fill in the gaps!